Ordinary number signature Leng UNC about 35,500 - 37,00 baht. Ordinary number signature Leng VF about 9,200 - 9,700 baht. 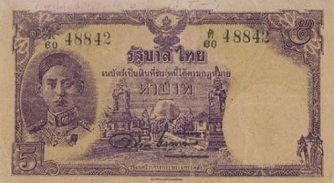 The 7th series 5 Baht type 2 banknotes is identical to type 1 in design but produced in smaller size and printed signature and serial number at the same time with black ink. They were announced on 12th September 1945. 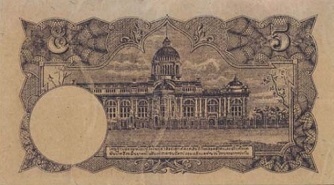 The main object is the image of King Rama 8 on the left. The middle image is Phra Patomjedi. The serial code and number were printed with red ink.